Reach and wash window cleaning company based in Gosport. We clean from the Gosport area to Southampton. With 20 years experience and fully insured. Our company specialise in reach and wash window cleaning. 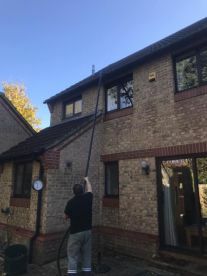 Windows are cleaned from the ground using a long reach telescopic pole, a soft brush is used to scrub the dirt off the glass while just of pure water rinses the windows to leave a spotless finish. We also clear gutters of leaves using a long reach gutter vacuum that removes all leaves, dirt and Debis. we also offer gutter, facia and soffit cleaning using the reach and wash system that we use to clean the windows. 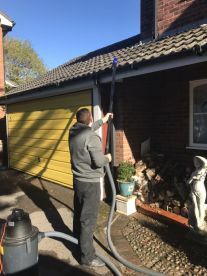 We pride ourselves in offering good value for money, many companies charge £5 per meter to clean facia and soffits we are a lot cheaper but still offer the same level of service and have many satisfied customers. Many of our valued customers told us that they were struggling to find the time to do their cleaning. So, we’re delighted to offer our broad range of cleaning services here at Prestige Cleaning Services. When it comes to cleaning, we perfectionists, and will ensure that every service makes your home shine. At Prestige Cleaning Services, we take the hassle out of cleaning. 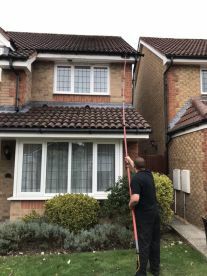 Whether you’re looking for window cleaning, gutters cleared or gutters, facia and soffit cleaning, we work to the highest standard and will leave your home looking good as new. Call us today to discuss your cleaning requirements. I called Prestige cleaning services for a quote and they came out the next day. Friendly and reliable service. can definitely recommend them. I needed a window cleaner and gave Prestige a call, very friendly and efficient and they do an amazing job. 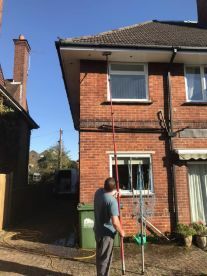 Darren and Louise came to clear our gutter and clean our gutters, facia and soffits and they did a great job. great value for money. will definitely use their services again! Please note that Prestige Cleaning Services Gosport may not be able to honour booking requests made.